These triple-layered strawberry pomegranate mousse parfaits are worthy of royalty! They’re stunning, elegant and most importantly, easy to make at home! 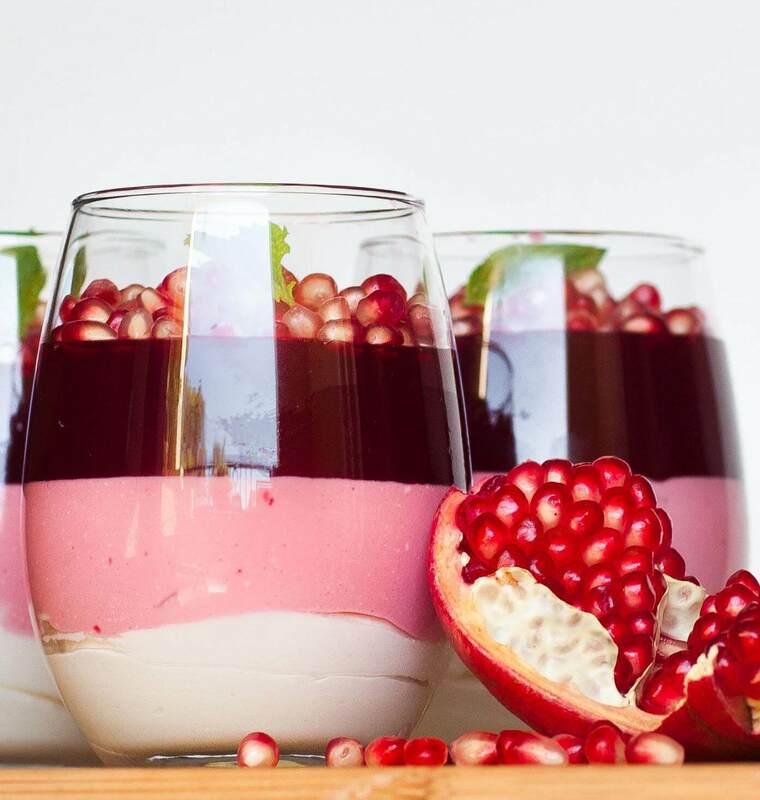 This no-bake pomegranate mousse dessert captures all the sweet and tangy flavors of the pomegranate in one cup! A triple layer treat with a no-bake cheesecake layer, followed by a creamy Jello layer and pomegranate-flavored Jello on top! The different layers will melt in your mouth and the crunchy pomegranate seeds are a perfect addition. For this pomegranate mousse dessert, I wanted to combine the creamy flavors of a no-bake cheesecake with the tangy and sweet flavors of the pomegranate. The first layer is simply white is a traditional no-bake cheesecake. It’s delicious, creamy and you’ll want to eat it by the spoonfuls! The next layer is made with the same cheesecake filling but the addition of strawberry jello. The flavor of the strawberry goes so well with the pomegranate! And for the final layer, more strawberry jello made with pomegranate juice! That last layer really brings home the pomegranate flavor! This dessert can be assembled in plastic cups if you want to take it to a party, or make it in glass containers if you’re hosting at home. Either way, this dessert will wow your guests! And, it can be made ahead of time, up to 3 to 4 days in advance; just keep it refrigerated until you’re ready to serve! For all the recipe details, watch my video recipe! This dessert can also be prepare as one large dessert in a round spring form pan or square pan. Simply follow all the steps but spread and pour into one pan! Enjoyed this pomegranate dessert? Check out these other delicious treats! Start by preparing 9 glass or plastic cups for the mousse; place them onto a flat baking sheet. Prepare the Jello for the middle layer. Combine 4 ounces Jello powder with 3/4 cup boiling water and stir until the gelatin is completely dissolved. Add 3/4 cup cold pomegranate juice and stir. Place into the refrigerator and let the Jello set about half way. It needs to be wobbly; stir every 5 minutes until it's at the right consistency; see video recipe for reference. Remove and let stand at room temperature while preparing the next step. Place heavy cream, confectioner's sugar and vanilla into a mixer bowl. Whisk on high speed until soft peaks form. Gradually add in whipped cream cheese. Soften the cream cheese at room temperature first. If you are not able to find WHIPPED cream cheese, whisk 8 ounces of regular cream cheese on high speed until light and fluffy before making your whipped cream. Divide cream mixture in half. Place one half into a large pastry bag and pipe equal amounts into each glass. Use a spoon to spread the cream to the edges, forming an even layer. Keep the remaining half in your mixer bowl. Pour prepared Jello into the cream and whisk on high speed until well combined; scrap down sides of bowl often to get all the cream incorporated. Stir in 1 cup pomegranate seeds with a spatula. Use a large spoon, or transfer the mixture into a pastry bag, and pour the prepared Jello mixture over the first layer. Transfer the cups into the refrigerator and let set for 1 hour. After one hour, prepare the last layer. Mix a 6-ounce package of Jello with 1 cup boiling water and 1 cup pomegranate juice. Let the Jello cool completely at room temperature before using. Pour the cooled Jello over the mousse to form the last layer. Transfer dessert cups make into the refrigerator and let the layers set completely; at least a few hours but preferably overnight. Can garnish the tops with more seeds if desired. Do you have any ideas for us people who cannot get our hands on jello powder? dessert ?I mean is this mousse cut and sliced with knife after reversing charlotte?????Thanks. hi dear Tatyana. why u dont use Pomegranate jello powder? just for taste ?? or in ur contry there isen’t? beacuse in my contry there is Pomegranate jello powder. tanx for answer and for recipe. Hi! if i were to use gelatin instead of jello powder, how much would you use? Making this for the holidays, They are just beautiful! Which layer do you want to use the gelatin for? This is perfect for the holidays! does the mousse set firm enough to take it out of a mold?